The following open letter was recently published on Facebook. With permission of the author, we're republishing in the hopes that its message will spread. You recommended abortion. You were our obstetrician, and early in my wife’s pregnancy you broke the news to us that our son would have Down syndrome. You predicted a miserable and very low quality life for our son and you firmly recommended that we terminate the pregnancy. When we decided to keep our “disabled” son, you and your staff never treated us with anything other than clinical detachment bordering on contempt. 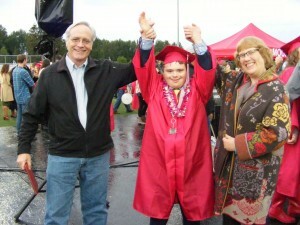 We haven’t seen you in 18 years, but I think of you frequently, particularly now that Silas is graduating high school. Here is the rest of the story, the part that would never have happened had we followed your advice. Silas has grown into a fine young man with more friends than you could imagine. He has won awards at school (Choir Member of the Year) and he was voted Homecoming Duke. His friends include both typical students and those with special needs and he treats them all equally. He is wildly popular and spreads good cheer wherever he goes. We are very proud of him and we couldn’t be happier. He has brought music into our lives, both literally and figuratively. He has sung off key for all of these years and he plays his keyboards each day. Should my wife and I break out in dance while he plays, his face lights up with joy and he is thrilled. His music is the backdrop to our lives, a beautiful melody that has been the soundtrack. Although the notes are not always correct, the music is perfect. Life could not be better. We are a family. As we left your office that day, we passed your “brag board,” the bulletin board that showed dozens of photos of you posing with new moms in the moments after their child was born. The pictures of exhausted, joyful moms cuddling their minutes-old babies, with you smiling up at the camera while still in your scrubs stood in stark contrast with the advice that we had just received from you. Walking past that wall was devastating, unforgettable. Here is my point. Those pictures seemed to predict a life of happiness and unlimited potential for those kids, but did it actually happen? Statistically, by now several of those families must have broken up. Statistically, some of those children probably ended up in trouble or on drugs. Certainly, some of them have come to despise their parents. Others with wonderful minds must be feeling the unrelenting pressure to achieve, a soul crushing experience for many young people. Did they have a happier life because they were “normal”? Lynne and I searched our souls, together, for days after you recommended terminating the pregnancy. We read the long list of possible medical conditions that our child might face and we were consumed with fear and confusion. We prayed- a lot. Finally, we faced the fact that our child might be born and live only a short while. Would our decision to bring him into this world, perhaps only to live an hour or two, be selfish? Maybe. But should he have a short life, we would fill it with love. His hours would be filled with kindness and he would feel our kisses and our tears. He would know his mother and father, hear our voices, hear us sing to him and have the sweetest life that we could give him, regardless of its length. We wanted him to experience being deeply loved and cherished. It’s kind of funny, really. Once you commit to that it never goes away. Raising Silas has been expensive. It has taken every bit of our fortune, and we live a much smaller life these days. The businesses, houses and extras are all gone. We have been broke for years… and we have never been happier. We replaced fun with joy and we replaced possessions with love. We upgraded in a big, big way. Almost no one understands how we can be so content. My hope for you, Doctor P., is that you eventually became wiser. Although you are undeniably smart and accomplished, your arrogance has a cost. You are a trained doctor, not a fortune teller, and you cannot see into the future. Your recommendation to terminate a pregnancy was based upon what? Fear? Ignorance? Or was it a mathematical calculation based upon potential earning power, which you equate with happiness? You see, we lost everything but we won life’s lottery. I won’t mail this letter. I never do and I write one each year. It’s not that I don’t want to talk to you. It’s that you wouldn’t remember me. How could you? You never took a picture of Silas and Lynne to put on your board. It’s too bad, too, because this is a story with a happy ending. Last night he graduated high school. The list of accomplishments of the scholars was astounding! The athletes were confident and amazing. The choir had won state awards. Beautiful, gifted people were everywhere, but the loudest cheer, the longest cheer and the sound that I hope is my last memory on this earth, was the stadium-wide applause for Silas.